Serrano ham… no Spaniard has grown up without this delicacy. In fact, if you opened every Spanish fridge I bet you could find ham (jamón Serrano) in 85% of them. That’s why we find it SO difficult to live without ham when we reside in the US. We know the price here is completely unaffordable but we simply can’t help buying and buying it. And don’t try to fool your Spanish kids with Italian or German ham. They will spit it out with no mercy. 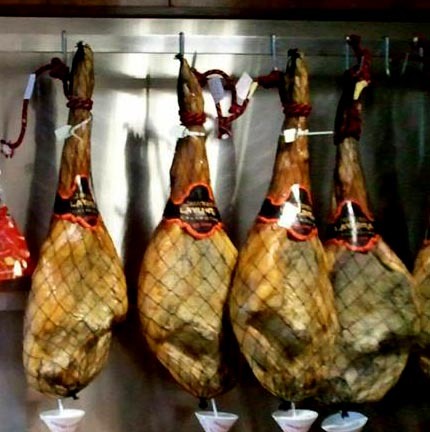 In theory, prosciutto IS like Serrano ham. Both come from the pork’s leg and the process is the same, as you can read at Wikipedia. But the final product is pretty different. I prefer Serrano ham because it is more cured, saltier and more intense in flavor and scent. And because I´m Spanish, of course! Yes, I know. You´re not a Spaniard. You can live without ham. You have lived without ham. And you´ve lived really happy. And it´s super expensive ($25 per pound). But… you should give our national treasure an opportunity for a special occasion. Because it is healthy, the preparation is a no brainer, and it´s simply delicious. Serrano ham has a high composition of proteins and minerals and a high content of monounsaturated fat (50%), a powerful antioxidant and is a good friend of your heart. After undergoing the dry-cured process, ham is high in minerals such as sodium, iron, potassium and phosphorus too. Incorporating it into your diet in moderation is a really good option for quick and tasty meals. And what about the calories? Don´t freak out! 3,5 ounces of ham are half as caloric as a cookie and less caloric than white boiled rice too. Less is more when you want to enjoy Serrano ham. No sauces (please! ), no spices, no preparation needed. The best way to enjoy ham is with toasted Italian bread, you could find it at every supermarket, extra virgin olive oil and natural tomato squeezed on the top. But you can garnish it with melon or grilled asparagus if you want to prepare a complete meal. Are you in a rush and guests are coming home? 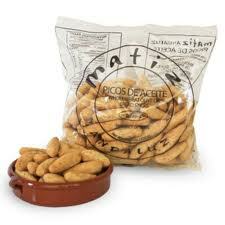 Serve ham with picos, a kind of Spanish little grissini made with olive oil too. The wine. Yep, you´ve paid a lot for your ham so you want to be savvy with the wine… I recommend a Spanish red wine made with garnacha grapes, like Borsao Tinto Selección 2011. You can find it for less than $10 and the quality is really good. After enjoying your Serrano ham maybe you will wonder Can I cook it diced in other recipes? Or What about trying the Iberico Serrano ham (much more expensive)? So yes you can. Yes, maybe one day you will indulge yourself and you will buy Iberico Serrano ham. But this is another story… and another post. Posted on July 19, 2013, in Products. Bookmark the permalink. 1 Comment. Y recomiendas el jamón serrano en pan italiano tostado… Pues muy bien.